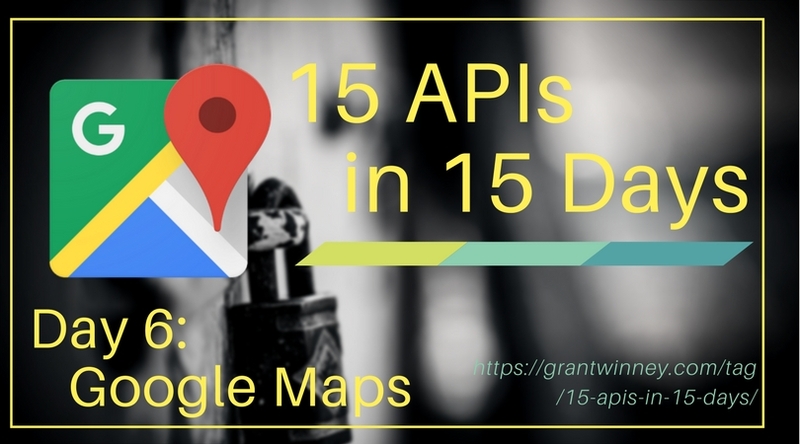 Continuing my search for 15 APIs in 15 Days (also on GitHub), I checked into the Google Maps API. Google is a service that... a provider who.... they run the Internet. They have this little mapping service too. The first one I thought looked interesting was the Geocoding API, which allows you to convert addresses to geolocation coordinates, and vice versa. Oddly enough, you don't need an API key to experiment with these calls - they worked fine for me without it. I'm not sure how they rate limit requests then, but you'd still need one for a real product, so if you're up for it then request an API key before doing anything else. Google's docs are pretty straightforward so there's not much else to say, except that you can just select "Create a new project". Be sure to copy the key it produces, because I can't find where to view it after the modal dialog closes, other than clicking "Get a key" again. If you figure it out, I'd like to know! 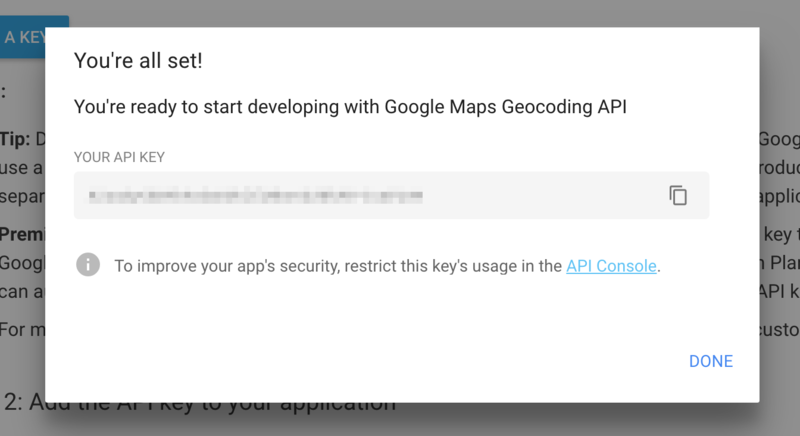 As they state, this automatically activates the Google Maps Geocoding API, and generates an unrestricted key. Whether or not you generated a key, you should be able to try a couple things out. Try looking up an address to get information about it, including its coordinates. How about trying the reverse, and getting the address again from the coordinates? I was suprised to find the results (a portion of which is shown below) included far more than I had expected (such as a bus station), only because the coordinates seem so specific. I searched for my home address and had similar results with the reverse search - the lat/long coords returned my house (cool), an address range on the street that intersects mine (we're a corner lot, so okay), and a few addresses at the county level and the closest major city (weird and vague). It's possible the list that gets returned is most to least specific, but why there are multiple hits at all I don't really get. That last API was straight-forward. Let's try looking up some directions with the Directions API next. You don't need an API token to test this one either, although certain parameters seem to require it. Create a new key if you want, and append it with &key=<your-api-key>. Pick an origin and destination. I chose the Terminal Tower (again) as the origin, and a Starbucks around the corner from it as the destination (I know, there's probably 2 Starbucks inside it), so the results wouldn't be too large. Note the section in the results called "steps", each of which have a start and end, total distance and duration, and even a one-line instruction in English. There are lots of parameters for specifying how the directions should be calculated. In the following request, I've chosen "walking" as the travel mode, told it to return alternative routes, and set the language to French. "Le calcul d'itinéraires piétons est en bêta. Faites attention – Cet itinéraire n'est peut-être pas complètement aménagé pour les piétons." So for now, just omit the API key. To calculate the required timestamp parameter, which represents the number of seconds since the epoch, use the Epoch Converter... assuming you can't just figure it out in your head. ;p Just copy the value where it says "The current Unix epoch time is ..."
The results include the Time Zone ID and Name for the location you specified. Since I used a location in Cleveland OH, and daylight savings time ended in November, I get EST back. I'm not sure why these calls didn't require an API key, since I'm not sure how they can enforce limits. Speaking of limits, the limits for a free API key are very generous, typically thousands of requests per day for each API - certainly enough for personal use or even something small for a team at work - so that's nice. Even though there are a lot of APIs, they seem to be very focused in purpose. It's interesting though, since the other APIs I've looked at are usually few (or one) with lots of endpoints that do different things. By breaking things up, it's probably easier to control access to one thing or another.